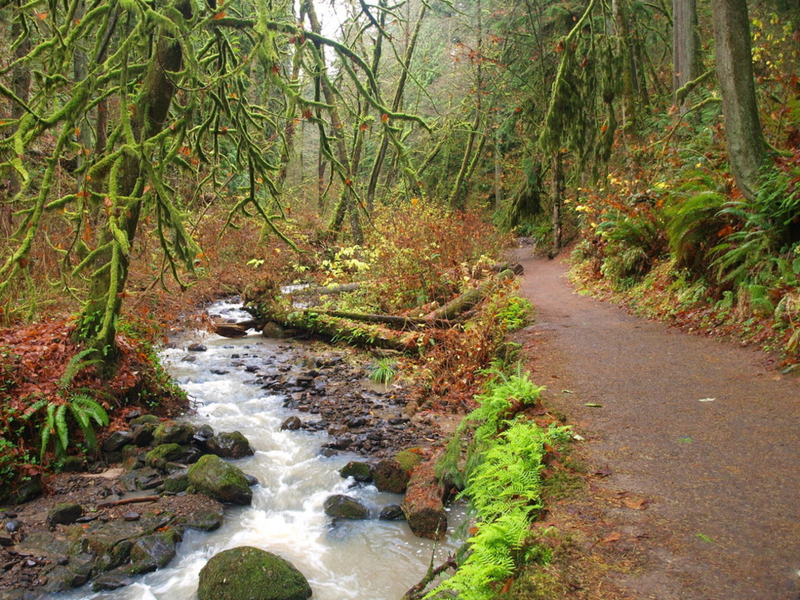 Forest Park is well known in Portland for being an escape from city life without actually leaving the city. In the early 1900s, a landscape architect that was in the city to prepare the Lewis and Clark Exposition of 1905 originally proposed the idea for Forest Park, but was shot down by the demand for jobs that lead to a woodcutting camp being placed in that area. The frequently accessed Leif Erikson Drive, was actually part of this plan to clear this land. Luckily, in 1946, Mazamas outdoor club built trails and started to plant trees and the land was dedicated in 1948. 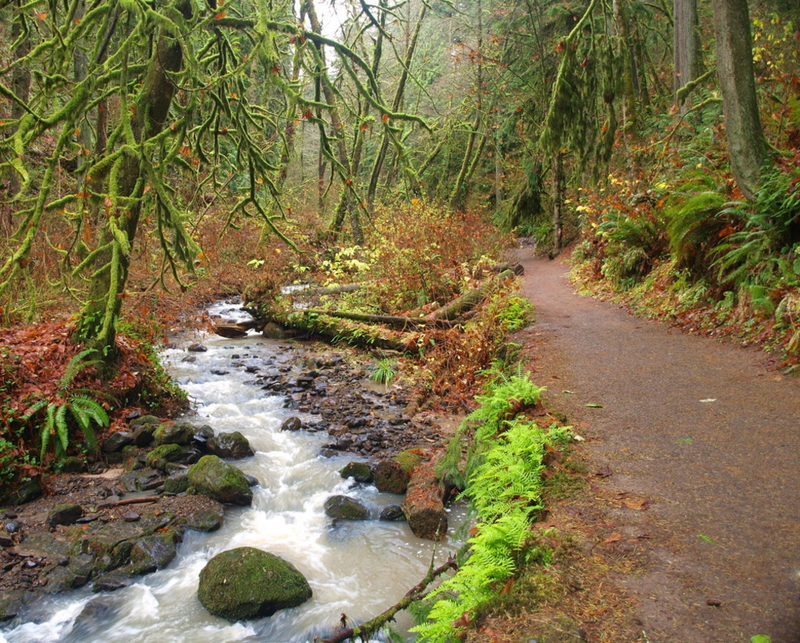 Balch Creek gently winds its way from the Lower Macleay Park trailhead, to the upper trailhead. What lies between is one of the most beautiful urban canyons to be found anywhere. The Wildwood Trail, which is the trail the runner will take for the majority of this route is a total 30-miles, quite a lot of green space within city limits. It is a reminder that Portland as a city has made this trail space a priority and is an inspiration to take advantage of its close proximity. Leaving from the lower trailhead at the terminus of Northwest Upshur Street, the trail begins on a smooth and paved path as it enters the canyon. But the concrete soon ends, and the surroundings become more wild and lush as the canyon walls rise. The largest Doug fir trees in Portland are in this part of the park, as well as native cutthroat trout. Discovered in 1987, the small population of trout that reside in this creek helped solidify efforts to restore the health of the entire watershed. The trail you start on from the Lower Macleay Trailhead takes you to a stone shelter and you should continue straight on the Wildwood Trail, which will take you to the Upper Macleay Trailhead. This route is quite short, so if you would like to continue on, the Wildwood Trail is a total of 30-miles, so the trail runner can continue on that once at the Upper Macleay Trailhead, keeping in mind that they will have to turn around and come back the way they came, despite several outlaying loop options that will either lead to a different trail or back to the Wildwood Trail. Perhaps the best Farm to Table dining in the city is just a few blocks away at Meriwether’s on Vaughn. They also have a great happy hour menu. Forest Park in general is a trail runner’s dream. The miles upon miles of varying elevations and landscape within the city’s limits is hard to beat elsewhere. There is definitely quite a bit of elevation gain and loss throughout the park, but nothing that a novice trail runner couldn’t handle without a few breaks to catch his breath. The section of trail described in this article is relatively flat, except for the large hill leading up to the Upper Macleay Trailhead. It is quite a challenge. Because this trail is an out-and-back either way, the runner will have to decide if she would like to confront this hill at the end of her run, if she starts from the Upper trailhead or in the middle of her run, if she starts at the Lower trailhead. Either way, it adds a little bit of a challenge to this rather short section of trail for a trail runner with any level of experience. To get to the Lower Macleay Trailhead, take a left on NW 27th Ave and then your first right onto NW Upshur St. NW Upshur St will lead directly to the trailhead. To get to the Upper Macleay Trailhead take a left on NW 24th Ave from NW Vaughn Street and take a right on NW Lovejoy St. Make a slight right onto NW Cornell Rd it will be the second labeled trailhead and on the right side of the road. You will see a big stone sign right in front of the pull off where you park. The Audubon Society of Portland is right next-door, so if you see that, you have gone too far.